Dr. Abbey J. Lee provides BOTOX® Cosmetic and Restylane® injections as an added benefit when receiving routine dental care at Smiles 4 Grant Park in Atlanta, GA. These facial esthetic treatments are a remarkable complement to cosmetic dentistry and can significantly reduce the signs of aging around your mouth, nose, and eyes, as well as improve facial contours where loss of volume has occurred. Dr. Lee has been helping patients achieve the smile of their dreams for over 25 years and is now proud to provide these safe and simple injectable treatments as a means to enhancing overall results. Because BOTOX® Cosmetic is designed to relax muscles, dentists have also seen improvements in patients with TMJ disorder and bruxism (teeth clenching and jaw pain) when injected into the surrounding jaw muscles. As the leading cosmetic treatment in the United States, this minimally invasive treatment can be administered in just 15 minutes and provide a 97% satisfaction rate. Patients can enjoy results anywhere from three to four months before retreatment is necessary. Restylane is a type of dermal filler made from hyaluronic acid, a natural occurring substance found in the body. Compared to BOTOX® Cosmetic, this treatment is injected into the underlying tissues below the skin to add volume and smooth facial contours. This safe and biocompatible material binds with the water inside the body to plump thin lips and fill out wrinkles and deep facial folds. Restylane can be administered in less than 30 minutes and provides results that last anywhere from six to 18 months. During your consultation, Dr. Lee will discuss your cosmetic goals in order to customize your BOTOX® Cosmetic or Restylane® treatment to meet your aesthetic desires. She will carefully explain the benefits to both to help you choose which treatment is best suited for your needs. For your convenience, she can combine your facial esthetic treatment with your complete smile makeover, or provide it during a routine checkup. Before treatment, Dr. Lee will numb the area being treated with a topical anesthetic for optimal comfort. She will then insert a small needle below the surface of your skin to inject the BOTOX® Cosmetic or Restylane® into the appropriate tissues until desired results are achieved. 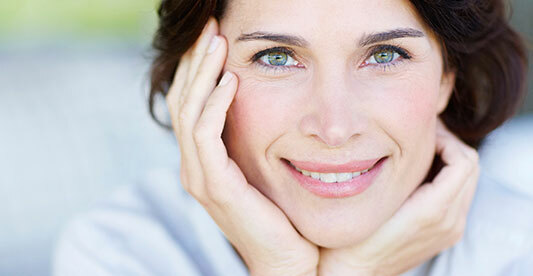 There is no downtime required for either injectable and you can return to normal activity immediately. You may experience some mild soreness and swelling for the first few days, but it can be easily managed with an over-the-counter pain reliever and cool compress. If you are interested in enhancing your cosmetic dentistry results with a facial esthetic treatment, contact our dental practice today online or by calling 404.328.7177 to learn more about BOTOX® Cosmetic and Restylane®. During your consultation, Dr. Lee will explain the benefits to both to help you achieve outstanding results.